This story on making farfalle with vodka sauce ran on Patch yesterday morning. Sunday Night Supper is now a regular column so thank you to everyone for reading and commenting. If you would like to comment and/or share a recipe, please go to the Patch site. Every so often, you need comfort food, the kind that makes you feel good the moment you bite into it. That happened to me the other night. I had been on steroids for a sinus condition that would not go away and had been yelling at my kids as a result. (I blame the steroids, not a prolonged midlife crisis, chronic sleep deprivation, a thwarted book project or the endless juggling of low-paying, part-time jobs.) I yelled at my older son for almost missing the bus/not setting the table/taking too long to feed the dog/surfing the Internet when he should have been doing his homework/not taking the garbage out quickly enough. I yelled at my younger son for bothering my older son. I yelled at my husband for not being there when I yelled at the kids. You can see where this was going. By the end of the week, the only one who wasn't scared of me was the dog. To make it up to everybody, I made a dish that I knew would make them happy: Pasta with tomato, cream sauce and vodka. I first made a tomato and cream sauce in 2008, when I started to cook from Mark Bittman's masterpiece of basic cooking How to Cook Everything: Simple Recipes for Great Food. His recipe for meat sauce, Bolognese style (aka ragu) is a miracle---creamy, thick, delicious, and extremely satisfying. However, it takes several hours to make, and requires some serious standing and stirring. I wasn't in the mood for that. I also wanted to make something quickly that didn't require rushing to the grocery store or bumming food off my neighbor. Better yet, I wanted to use up what we had sitting around the freezer and fridge. We had some leftover cream from some corn pudding and pots de creme I had made a few days earlier. This wasn't light whipping cream, but old-fashioned heavy cream, that staple of classic French cooking that is so often avoided in these fat-free, calorie-conscious times. I had an untried recipe for farfalle with vodka sauce that called for heavy cream and I knew it would turn out well because I had sampled it in cooking class. 1) Buy (or ask to be given) white serving pieces. They go with everything and food shows up best on them. 2) Toss salad in a bowl but serve it in a platter. All the heavy stuff falls to the bottom of the bowl. 3) Spin the salad bowl as you pour dressing onto it and then mix it with your hands. 4) Put the stems of parsley into chicken stock because stems have the most flavor. 5) When you rub oil into a roasting chicken, massage some of the oil into your cuticles. 6) Don't rely solely on balsamic vinegar when making salad dressing. Try pear or peach vinegar. Better yet, make your own vanilla vinegar (recipe below) and use that. 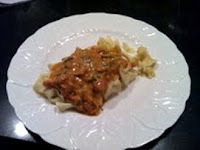 The only thing Ward's recipe called for that we didn't have was the farfalle (bow tie pasta). I substituted egg noodles and they worked very well. (Ward says you can use any pasta that has an interesting shape.) All of the other ingredients - canned tomatoes, parsley, sage, eggs, Parmesan cheese - you probably have on hand. I also did not have the block of fresh Parmesan cheese that Ward suggests. I had a plastic container of the cheap already grated stuff and it still tasted delicious. Not really, though between the cream, the Parmesan cheese, and the egg, there is a lot of protein in in it, and between the canned San Marzano tomatoes, the sage and parsley, there's a nice combination of fresh vegetables and herbs. Plus, this dish, though it tastes expensive, is actually pretty cheap to make. But low-cal and low-fat? No. Both my kids have become weight-conscious in the past year. My younger son plays football and my older son wrestles. Both have to be weighed in before the start of games and matches. If they weigh too much, it's a problem. Once upon a time, I thought that by having boys instead of girls I would never have to worry about inadvertently giving my kids eating disorders or worry about them obsessing about their weight. But because they care (and because God knows I do), I try to make low-fat food and keep the carbohydrates to a minimum. But the beautiful thing about cooking with cream is that a little goes a long way. You don't need to eat a lot to feel satisfied. One portion is usually enough. And a little rich food in the middle of cold, gray November is a great treat. In fact, the only thing wrong with this dish is there wasn’t enough of it. It made six small servings. If you have more mouths than that to feed and/or you want to freeze the leftovers, double the recipe. In a large shallow skillet, heat olive oil, add butter and sauté onion and garlic until softened. Do not let it brown. Carefully add vodka and let it reduce. Add tomatoes, stock, cream, sage and salt. Simmer sauce using aware whisk to bring sauce together. Simmer until sauce has thickened and coats a spoon. Set sauce aside until pasta is drained and ready to serve. In a large 8-10 quart pot, boil pasta in salted water. When it's done, drain and set aside. Returning to the sauce at hand, heat the cream mixture. Add a little of the hot sauce to the egg yolk. Whisk egg into warm sauce and remove from heat quickly. Toss in cheese, sprinkle with parsley, salt and pepper to taste. To make homemade vanilla vinegar, select good quality white wine vinegar such as Champagne or Riesling. Add 1 split vanilla bean to a new bottle and let marry in bottle for several days or longer.